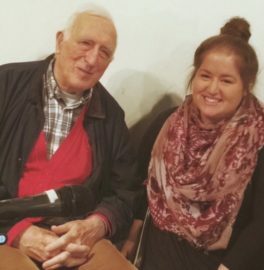 “I could not stop smiling,” said L’Arche Boston North assistant Ariana Bachman about her week in Trosly, the French village where L’Arche was founded in 1964 and where founder Jean Vanier still lives today. That hardly seems to qualify as news. 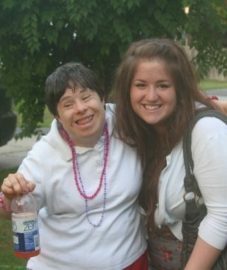 As head of Nazorean House and a L’Arche Boston North Assistant for nearly ten years, Ariana smiles often and broadly. For six days, December 4–9, she was one of twenty-six L’Arche assistants from around the globe engaged in the first half of a two-part formation called “Together in Mission.” The second part will take place in Poland next spring. The formation was offered for assistants with at least five years in community. Still only in her mid-twenties, Ariana first began coming to community events at age fourteen, when her father was on the board. At seventeen, she was invited to begin assisting Katie, a core member, with her after-dinner activities: shower, dental care, exercise, a bowl of Jello, prayer, and so to bed. Ariana compared the lack of support for people with disabilities in some countries with the far better situation in Massachusetts. “We are ahead of the game in the disabilities world,” she said. At the formation week, Ariana was the only assistant from North America. Workshops were half in French, half in English, with translators provided. Among the speakers were the first community psychiatrist and, of course, Jean Vanier.